Alternately reddish or ochre-coloured, brilliantly luminous or veiled in black, the moon reveals an infinite palette of subtle nuances to the naked eye. Nonetheless, the accounts given by astronauts who have seen it from close up testify to an entirely different reality. When viewed at close range, it turns out to be a bleak and grim landscape composed of dreary shades of grey, oceans of dust and ashes, cliffs and craters of cooled lava that scientists date back three billion years. 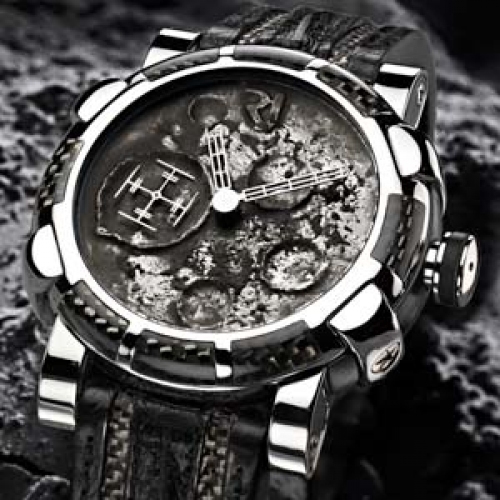 To create this light which is foreign to human perception, Romain Jerome has used a revolutionary treatment to coat the dial with a mineral layer comprising authentic moon dust combined with natural pigments. Limited edition of 1,969 watches.